This is a program that will make all of your MP3 renaming a breeze! See the features section below for more details. View the help file online here. Programmed in C++ Builder 5.0. Supports the ID3 v1.1 and ID3 v2.3.0 standards. Automatic detection and notification of ID3 tags. Automatic importing of ID3 based on filename. 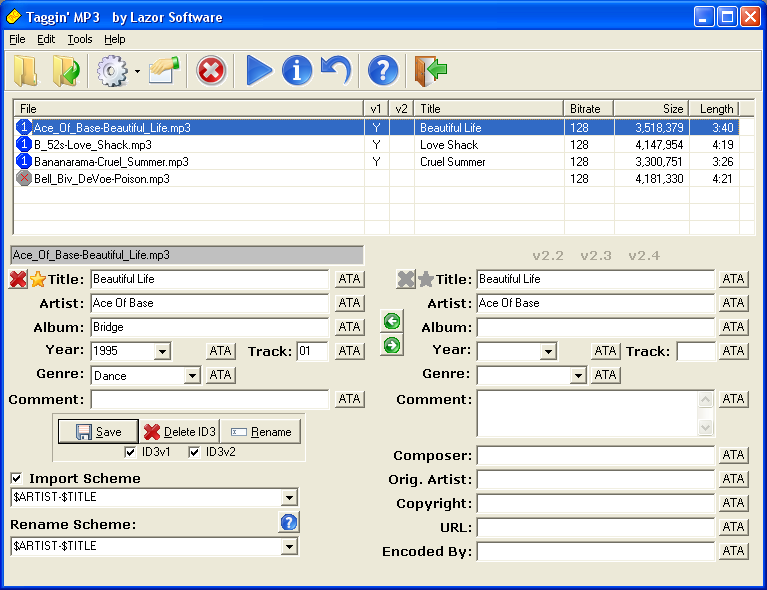 Renaming of files using title, author, album, comment, year, genre, and track (in addition to other common fields). Global modification of ID3 tag field(s). Ability to ignore ID3 tags when batch renaming. File information, such as bitrate, length, file type, etc. And after all that, still FREEWARE! I'm sold! Let me download it now!